Gallery of cosmetic make-up or canon of facial symbols. It is possible by means of divinations and predictions to choose hexagrams of the canon of changes i-jing and physiognomic symbols of emotions for cosmetic make-up and facial design if woman cannot know emotional expressions which will be attractive for a man. The open mouth and sad eyes seem calm as eyebrows express quiet emotions. The open mouth and quiet eyebrows seem dismal as eyes express sad emotions. Quiet eyebrows and sad eyes can seem candid as the mouth expresses open emotions. Sad eyesight is quiet as ideas are calm, but in sensations there is no peace. The person cannot reach desirable and consequently intentions deny admiration of feelings. 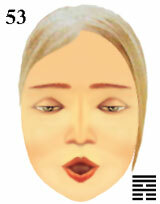 canon of physiognomic symbols for facial make-up.